Sculptra is a FDA-cleared dermal filler used for treatment of facial volume loss. Made with poly-L-lactic acid, Sculptra replaces lost collagen and works well to reduce pockets and wrinkles on the face. This product has been widely used around the world since 1999 and the treatment has been performed on over 200,000 patients in more than 30 countries. 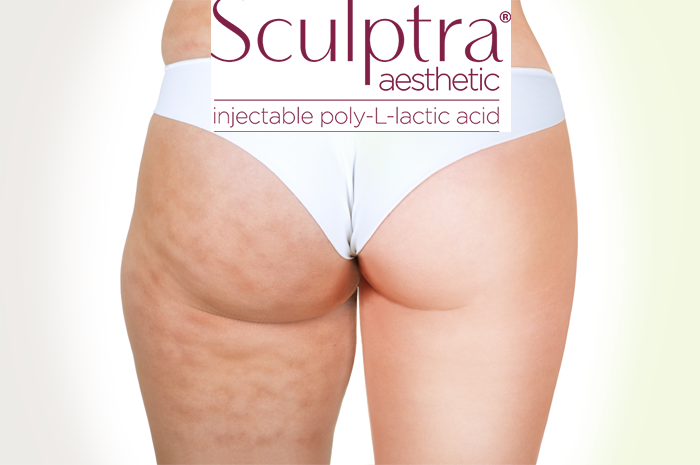 With a series of treatments over several months, Sculptra is injected directly into the affected area. Gradually, it stimulates collagen and fills out the depleted tissue. Results of Sculptra can last as long as 2-5 years. Eventually, the product is harmlessly absorbed by your body. We fill in the dimples and creases associated with the cellulite with injections. The correction is seen immediately but that subsides rather quickly because it is mostly saline. Over the next several weeks, collagen is gradually built up from the PLLA injected, and the cellulite appearance improves. Severe laxity and “cottage cheese” of the skin is not correctable. After your cellulite treatment, we will send you home with instructions for post-operative care. Please follow instructions carefully and feel free to ask questions after your appointment. If necessary, we’ll schedule any recommended follow-up treatments before you are discharged. A Sculptra treatment may cause initial side effects like minor bruising, bleeding, swelling, or bumps. We also perform a quick massage of the treated area, so the product is evenly distributed. If you are concerned about Sculptra side effects, please ask for more details during your consultation.